The first two 15-lap races of the Nexa P1 Powerboat races concluded today at Mumbai's Marine Drive to decide the grid position for tomorrow's grand finale. Sam and Daisy Coleman of team Baleno RS Boosterjets will take pole tomorrow after accumulating the most points in today's races after a double win. James Norvill and Christian Parsons-Young will start from P2 with 31 points, while Craig Wilson and William Enriquez of Lloyd Dolphins are on P3 for the race with 30 points. Sam and his sister, Daisy were on pole position for Race 1 after posting the fastest time in yesterday's qualifying round. But unlike in on-shore circuit racing like Formula 1, all the competitors start parallel to each other, but the pole sitter starts from the inside line, giving him an advantage. While the Colemans lost the lead to Norvill and Parsons-Young, good racing strategy saw them retake the lead a few corners into the race. They managed to hold the lead right to the end to take the win and the 20 points that come along with it. Finishing second in the race were John Donnelly and Kevin Burdock of the Mirchi Mavericks gaining 17 points while team Lloyd Dolphins' Craig Wilson and William Enriquez scored 15 points for third place. Race 2, which was held on a reverse grid, saw the Colemans start furthest from the inside line. Donnelly and Burdock took the lead initially, but within a couple of laps, the Colemans were right on their tail. As Donnelly headed for the mandatory pit lap, Coleman took the lead and held it right through to the end. Soon there was a fight for second between Donnelly and Norvill. But it was Norvill who took second by the next lap, while Donnelly held third right up until the final lap. 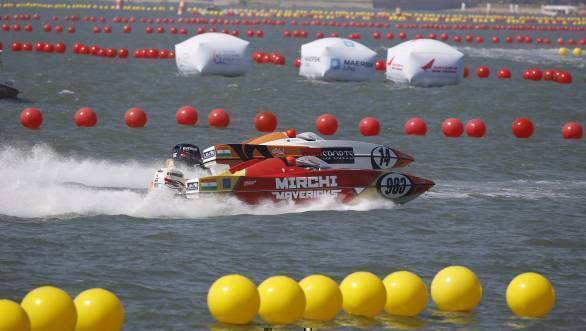 With just two corners to go till the finish line, Donnelly was stuck in the wake of Norvill's boat as he was taking the turn when an engine mount broke. The boat tilted left and the nose dived into the water, causing it to turn turtle. Fortunately they were rescued almost immediately and are fine. This gave Wilson and Enriquez third place. With respect to the overall team points, the Baleno RS Boosterjets are leading with 59 points while the Lloyd Dolphins are just two points behind them. The Money on Mobile Marlins are third overall with 52 points. 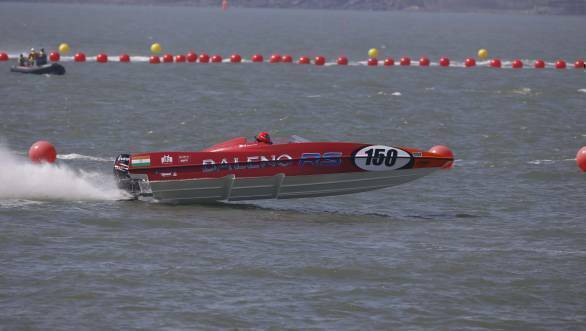 Gaurav Gill managed to score 25 points and is fifth overall after finishing sixth in the first race and fifth in the second race. CS Santosh, who is eighth overall, finished eighth and ninth, giving him 19 points. The grand finale, which is scheduled to be held tomorrow, will be a 20-lap race with three mandatory pit laps instead of today's two.